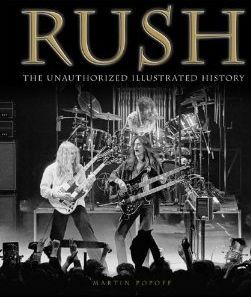 Martin Popoff’s New Rush Book: From Unauthorized to Authorized? 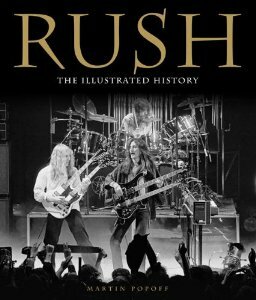 Well, we know Martin Popoff has been busy in the months since his new book, Rush: The Illustrated History , was announced: the cover subtitle has been changed from “The Unauthorized Illustrated History” to “The Illustrated History.” Click on the two versions of the book cover to see. Popoff’s first Rush book, Contents Under Pressure , was a walk-through of each of the band’s albums up to their 30th anniversary live album. The book was based on sit-downs with Alex, Geddy, and Neil, who reminisced about each of the albums. Popoff’s new illustrated history includes album reviews written by music journalists and commentary from fellow musicians. It also includes a discography. Key to the whole thing, though, is its collection of photographs and memorabilia. As J. Cohen on Amazon says, “There are a TON I have never seen and I thought I had seen ’em all.” Cohen’s full comment is below. He’s the first person to post a review of the book on Amazon. Well, that question might be answered now. Previous coverage of Popoff’s book. ~ by rvkeeper on May 23, 2013.